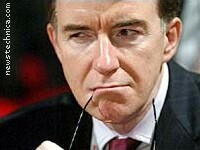 GEFFEN, Westminster, Wednesday (NNN) — Lord Mandelson has today announced that the outgoing Labour government will be going ahead with the “three strikes” plan against Internet filesharing, thus ensuring the widespread use of encryption in all routine network communications. Lily Allen joke nicked from Neil Dunbar on the Open Rights Group list. Cheers!